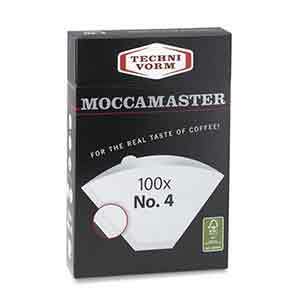 The Moccamaster is a great way to brew larger batches of filter coffee, easily making up to 10 cups at a time. If you’re already twitchy and a full 1.25 litres is a little scary, just scale back the coffee and water in the usual 1:16 ratio of grounds to water. 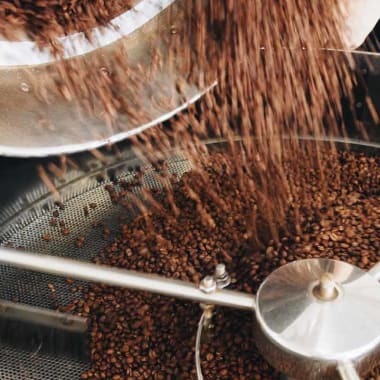 You’ll want to grind slightly more finely than you would for manual pour-over techniques such as V60 or Chemex. The Mocca Master’s heating system works best with water at cooler temperatures. Move the switch on the side of the basket to the setting marked X. Turn on the switch and make sure the carafe is pressed against the brewing chamber. Once the filter basket is half-full of water, use a spoon to mix the slurry and make sure the grounds are all evenly damp — be careful not to rip the filter paper. Move the switch on the basket to the setting marked O, which will allow coffee to pour out into the carafe. Towards the end of the brew, gently lift and re-seat the filter basket in its holder. This will help settle the bed of grounds to ensure an even extraction. Give the carafe a gentle swirl to mix, then share your brew with your friends. The carafe that comes with your MoccaMaster is insulated and will keep coffee warm for up to 90 minutes or so. If you’d like to keep your coffee warm for longer, it’s worth using a vacuum flask with a glass inner vessel to keep your coffee warm longer. Grab some brewing gear, supplies, and coffee from our online store.